OXFORD, Miss. 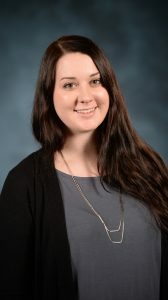 – Alexandria Gochenauer, a University of Mississippi School of Pharmacy student, was named one of the winners of the International Academy of Compounding Pharmacists’ Spring Writing Competition. Her winning essay also has been accepted for publication in the July-August issue of the International Journal of Pharmaceutical Compounding. “I felt honored that my essay was selected as a winner of the student writing competition,” Gochenauer said. “Receiving this distinction encourages me to continue pursuing my interest in compounding pharmacy as a career. Gochenauer wrote her essay based on this question: How can compounding pharmacies remain competitive with increased health care costs and reduced rate of insurance reimbursements? The rising fourth-year professional student focused on the customizable nature of compounded medications and how it can lead to cost savings for patients, pharmacies and the health care system as a whole. Originally from Republic, Missouri, Gochenauer said her Pharmacy Management and Business Methods class helped her to develop background knowledge for the essay, while Erin Holmes, UM associate professor of pharmacy administration, played a vital role in her search for compounding literature. Gochenauer was inspired to enter the competition by Jim Yawn, an Ole Miss pharmacy alumnus and owner of Uptown Pharmacy in Madison, Mississippi, who actively promotes independent pharmacy practice to students.